Remove the debris. If the winter’s seemingly incessant wind, rain, and snow have done a number on your trees, start your clean-up efforts by collecting the fallen branches and scattered sticks. If your town doesn’t pick up lawn debris on a regular basis, find out if any spring collection days have been planned or if there’s a nearby drop-off location you can deliver it to. You also can rent a wood-chipper from many garden or hardware stores and turn your debris into mulch. Rake dead leaves and twigs. Last year’s leaves will make great compost, but not if they keep the grass from absorbing sunlight. Thoroughly rake the yard and garden beds and, if you don’t plan to compost, investigate whether your town will be making special arrangements to collect bagged leaves. Prune and trim. Prune back weatherworn bushes and hedges as well as any perennials that look overgrown. Trim damaged tree limbs and branches that you can reach, and make arrangements for a professional tree-trimmer to take care of the rest. Map out landscaping and garden plans. If you’re going to make any changes to your current landscaping, make a sketch of your lawn indicating what sort of trees, shrubs, or plants you’d like to add. Even for DIY types, it’s always a good idea to consult with a gardener or landscaper at the nursery before making any final decisions or purchases. Start planting. Check the planting dates on your new purchases. 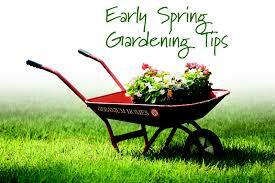 Any plants, trees or shrubbery hearty enough to survive early spring’s still-cool nights can be put in the ground now.